The photo-sharing app, Instagram can really support in growing brand awareness and has become a key tool for businesses of all sizes in supporting their overall marketing strategy. As of September 2016, Instagram had reached over 500 million active users making it the eighth largest social network used, so definitely one to take advantage of. One crucial way of gaining the largest return from Instagram is growing your followers, allowing your messages to reach wider audiences that value your posts. The world’s elite brands and most famous celebrities boast Instagram followers in the millions, a fact that they are able to leverage when it comes to promotions and marketing aimed at a rapt audience. However, even with a modest amount of followers, your Instagram account can also leverage the benefits and in time turn followers into customers. If you’ve only recently launched your Instagram account or have had one for a while but still do not have many followers, these 6 tips can help propel you in the right direction and get your follower numbers growing without spending a penny. Before you start, you need to realise that not all followers are created equally. There are many fake or ‘dummy’ accounts out there, designed solely as advertising bots or to provide ‘for hire’ likes and comments. While they may artificially inflate your numbers, these are not users that you want to attract as they will never truly interact with you or purchase your product. These types of followers will also distort your analytics down the line, so stay away from offers of many followers through automated systems. Look at brands and businesses that are similar to yours, and take note of the specific hashtags that they use. By clicking on the hashtags, you can see how many times this one in particular has been used, both lately and over time. Choose the ones most suited to your desired clientele, and use them liberally in your posts. By using these hashtag, your posts will appear in search feeds for people searching this tag, which can really help get your posts noticed. Here is an example of current hashtags related to gyms showcasing the amount of posts each tag features in, great to use if your business targets people who are keeping fit. Users are smarter than ever, and they can sense content that looks desperate, ‘slapped up’ or that is too ‘salesy.’ Limit your sales pitches and posts designed solely to sell products – instead, fill your stream with high quality original photos, captioned with smart and witty content. This will provide value to your desired demographic and keep them interested in your posts, which is key to building loyalty. So if you know your customers go to gigs then post some photos at a concert or a new music release. 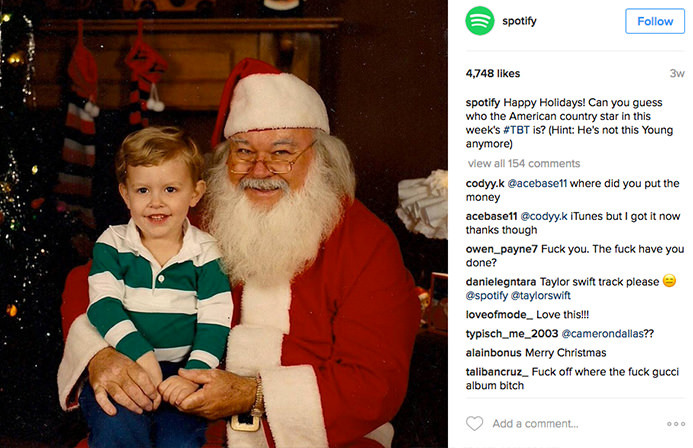 This post by Spotify, the music streaming app, doesn’t promote tickets but instead pulls on music lovers strings to get them involved in guessing which music star this young boy turned out to be, creating buzz and discussion on the brands page. Contests and giveaways are a great way to entice people to follow your account. Choose a valuable, desirable prize, and make entry contingent on a ‘follow’ and a repost, and you should see new followers from many avenues. Make sure you tag the photo caption with relevant keywords to get the post out there too. 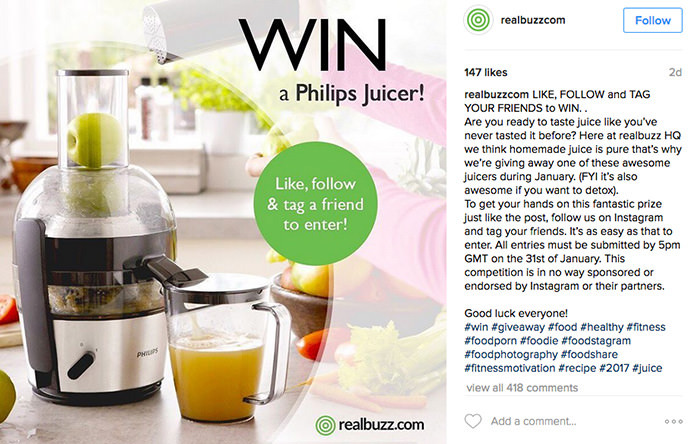 This example below from realbuzzcom shows them giving away a Juicer and in 2 days received 147 likes and 418 comments from a modest 7,141 followers. Genuine likes and comments (not from a bot) are the friendliest way to gain new interest in your own account. By popping by another person’s page to ‘say hello’ you will give them incentive to visit your page and follow you in return. This dialogue keeps Instagram fun, fresh – and most importantly, a profitable business tool. For example if you sell active wear then it’s worth commenting and interacting with people posting about going to the gym or for runs. 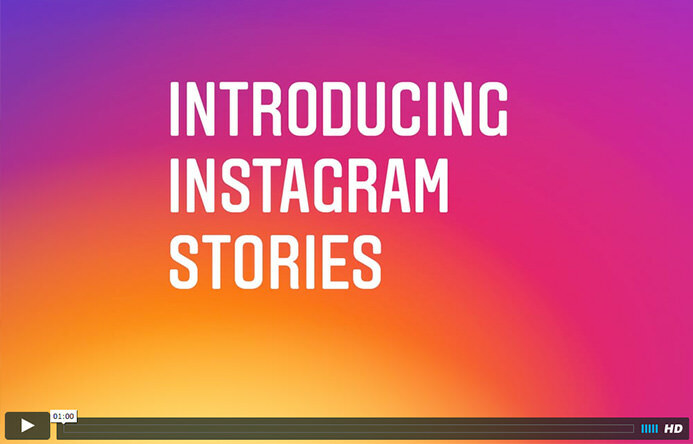 Inspired by Snapchat, in mid-2016 Instagram added a new feature called ‘Instagram Stories’. This feature allows you to post snapshots of interesting moments in your day as videos and photos that appear in a slideshow format. If you really want to get super active on Instagram but without polluting your feed throughout the day and possibly becoming a nuisance to your followers then adding in stories to your profile is the way to go and is another way to really engage with followers. These stories disappear after 24 hours and wont appear on your profile page. You can watch a video on Instagram Stories here to find out more.